* Mariell's glamorous Crystal Hair Comb is 5" w x 2 5/8" h.
* This bold Headpiece will create a spectacular Wedding or Prom hairstyle. 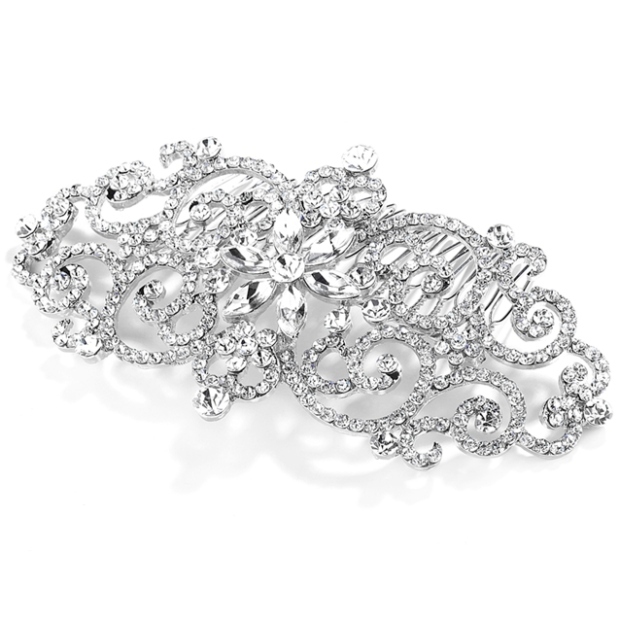 * Our Silver Rhodium Hair Comb will illuminate bridal, prom or pageant hairdos with 100's of shimmering crystals! * Mariell's dazzling crystal wedding or prom comb is the latest in bold headpieces which are "jewelry for the hair"! * This statement piece will give your customers maximum glamour at an exceptionally affordable wholesale price! * A top-selling Hair Comb, this one is a must have in your store's hair accessories display for bridal, pageant, homecoming and prom. * This brilliant wedding comb will add a regal vintage look (with unmistakable bling) to any special event!